Recently I’ve learned the woven shibori technique. It is a quite complicated technique that is time consuming to say the least – however the outcomes are truly unique. 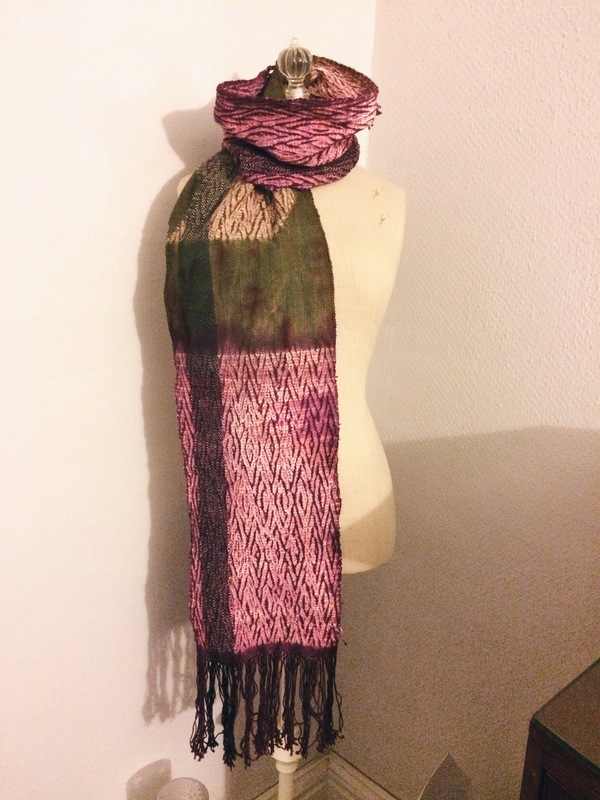 I’ve practiced both weaving and dyed shibori techniques (on cotton) before, but now the two techniques are combined into one. Weaving itself is an extremely complicated process that I’ve finally mastered, so I was excited to take it even farther into a dyeing process after the weaving was complete. Shibori, when practiced on cotton or another natural fabric as I’ve done before, is a complicated form of dyeing but an easier concept to grasp. When something is dyed using shibori style, it means that there are threads sewn into the fabric that are then pulled extremely tight before the fabric is dyed. Once the piece has dried, the strings can be taken out and you can finally see the type of resist the strings made in the fabric when undergoing the dyeing process. 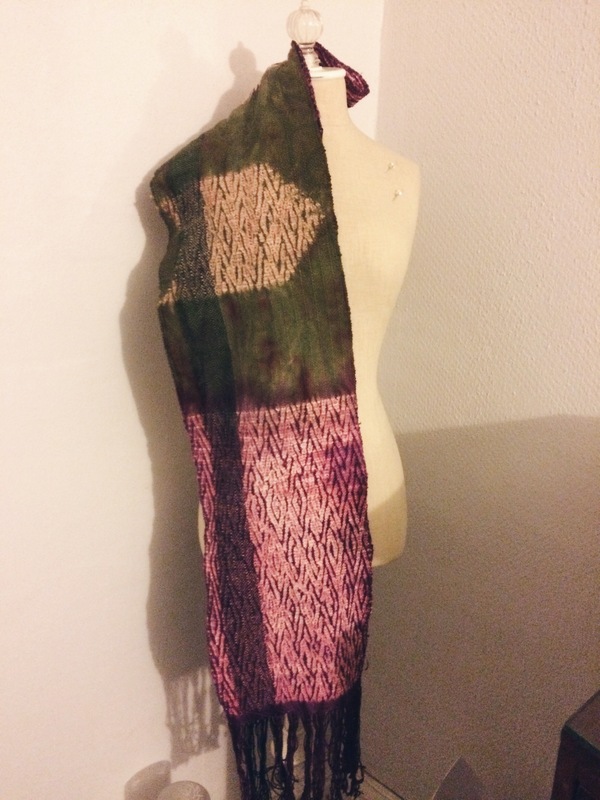 Therefore, in order to combine the two techniques of dyeing and shibori, the same concept stands. 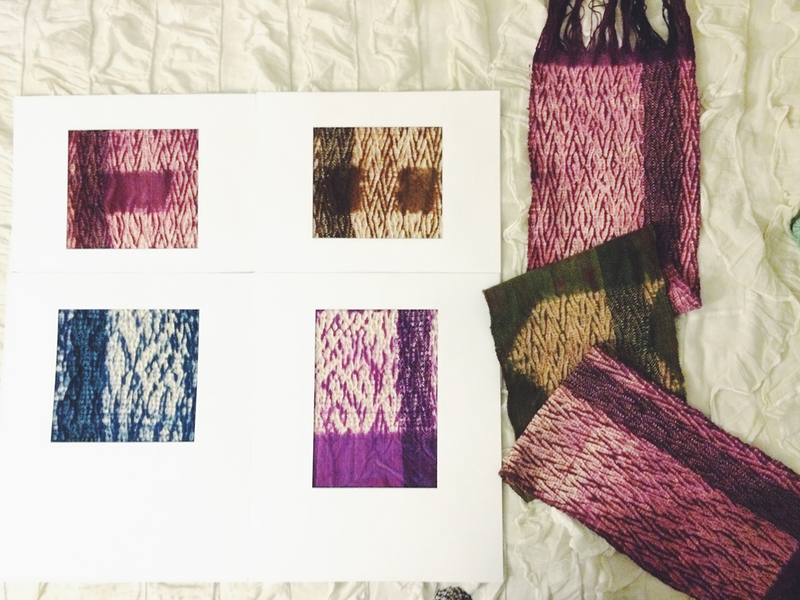 When starting woven shibori, you first pick a pattern you want to execute. Then, you must set up your weaving loom accordingly. Steps on how to dress the loom can be found in my previous weaving post. Once the loom is set up, you will weave your pattern the way you normally would, but instead you will weave at least two plain weaves in between each step of the pattern. The plain weaves should be white yarn and the pattern weaves can be any other color as long as it is a very strong yarn that is suitable for extreme pulling. You can also experiment with whatever pattern you are weaving – you can choose to use more than two plain weaves in between each step or to play with the steps of the pattern a little. The only other thing you must do while weaving is to make sure that the woven steps of the pattern stick out on the ends so that you are later able to pull them from the woven fabric. The woven color yarns of the fabric are the strings that will be pulled from the fabric while undergoing dyeing such as the strings in the shibori dyeing process on cotton. The color yarns will be removed from the piece after the dyeing process. 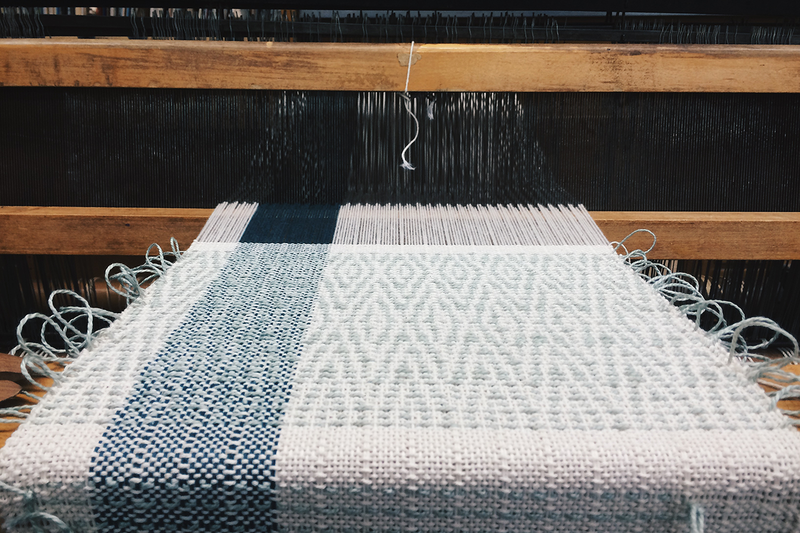 Once you are done weaving your piece for however long and wide you want it to be, you will take it off of the loom. Then, the same way you would do in regular shibori practice, you will tie knots with all of the color yarns on one side of the project, and then pull the same yarns on the other side as hard as you can. Then you can tie the yarn strings on this side of the project so that that piece is secured and is gathered tightly together. After the gathering of the color yarns is completed, which itself is quite time consuming, you can finally dye the piece. The pattern will be tied into the piece so that when your piece is completed, all will be dyed on the woven fabric except for the pattern you used which will remain white. You should find out the exact amounts of each to use for your individual dyeing process, but the dye bath that the fabric will sit in for at least 45 minutes will consist of water, salt, soda ash, and dye concentrate powder of your color choice. When you take the woven piece out of the dye bath, let it sit until it is completely dry. This may take a day or two at most. Once the piece is dry you can finally take the color yarn strings out of the piece with a scissor or seam ripper. What you should see is a dyed woven piece with the pattern you chose to use remaining white and mostly untouched from the dye. 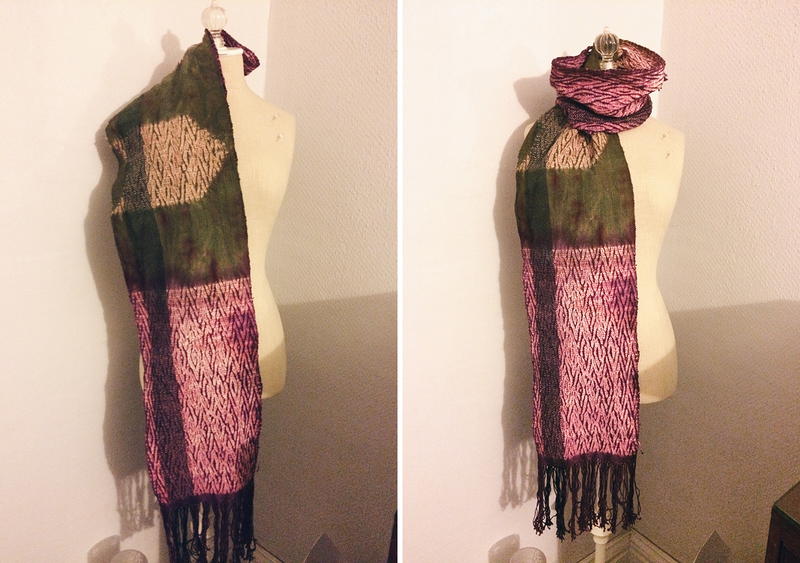 All that’s left is ironing the piece and you have completed a woven shibori project. Like I said before, the woven shibori process is extremely tedious and this post just covers a quick overview of the process, however, the outcome is truly interesting. In other news, the Buffalo Small Press Book Fair is coming up this year on April 18th and 19th. I’m proud to say I’ll have a stand at the fair selling my fiber art – some of which is on my Etsy site: www.etsy.com/shop/FiberArtandDesign. The Small Press Book Fair is a great opportunity to check out what a ton of local artists in Buffalo are working on, so if you are interested in books, crafts, or anything art related you should definitely attend the fair. *You can also find some of the items featured on this post on my online Etsy store.